Representative Ilhan Omar has a way of attracting attention. Four months ago, the Democrat became the first Somali-American — and one of the first two Muslim women — to serve in the U.S. Congress. Her election was heralded by many as a sign of a more diverse generation of politicians coming to power on Capitol Hill. 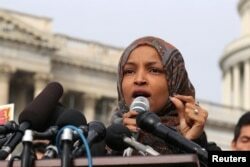 But just weeks into her first congressional term, Omar ignited a controversy with a tweet invoking an offensive trope suggesting U.S. lawmakers' support for Israel was swayed by money from the powerful lobbying group, the American Israel Public Affairs Committee (AIPAC). Shortly after her apology for that tweet, Omar suggested in a public statement that lawmakers held a dual loyalty to the U.S. and Israel. Omar's comments triggered two Congressional resolutions condemning hate speech. Members of Congress on both sides of the aisle, including senior Democratic leadership, strongly criticized Omar for making remarks that many felt crossed the line into anti-Semitism. In a speech Sunday to the opening session of AIPAC's annual conference in Washington, House Majority Leader Steny Hoyer of Maryland declared that "What weakens us … is when, instead of engaging in legitimate debate about policies, someone questions the motives of his or her fellow citizens." The controversy jeopardized Omar's high-profile assignment on the House Foreign Relations Committee, while giving a House freshman an unusually high-profile role in a long-running and contentious U.S. foreign policy debate over Israel and its treatment of Palestinians. But in the Minneapolis-centered Minnesota 5th Congressional district that Omar represents, the nation's largest Somali-American community sees the controversy differently. For the Somali-Americans who watched the election of one-time refugee Omar with pride just a short time ago, they are suspicious and troubled by the negative attention. "The reason there is a lot of attention on Ilhan Omar is because a lot of differences came into the Congress — a Muslim woman, a hijab woman, an African woman — a lot of differences, that's what brings attention," Somali-American Bashir Jama told VOA recently at Village Market, one of Minneapolis' largest Somali malls. "We were watching the criticism of Ilhan Omar, but we do not believe she is behaving with hatred toward Jewish people. I think that's a misinterpretation against her," Ali Muse, a Somali-American, told VOA. Somali-Americans make up only part of Omar's racially diverse district, which is overall 70 percent white and trends toward a young, urban and highly educated population. The district was the first to elect a Muslim to Congress, sending now-Minnesota Attorney General Keith Ellison to Washington beginning in 2006. The district also includes the St. Louis Park suburbs that are home to a strong Jewish population. Leaders in the Minnesota Jewish community have been deeply hurt by Omar's allegations but are also aware of the fine line they have to walk to maintain the historically close ties between the Somali and Jewish communities here in Minnesota. "This is not an attack or critique on Congresswoman Omar because she's a woman of color, because she's of Somali descent, because she wears a hijab," said Avi S. Olitzky, a senior rabbi at Beth El Synagogue. But he says Omar's comments are particularly dangerous in a growing atmosphere of anti-Semitism. "The language really echoed upon anti-Semitic tropes that have been used throughout the centuries, accusations of Jews having dual loyalties to foreign countries — specifically Israel — or Jews with their associations with money and buying political favor," Olitzky told VOA. Jewish leaders have met with Omar and her staff to follow up on her comments and inform her about the hurtful consequences. They say this controversy should be an opportunity to inform the public about damaging stereotypes and caricatures, not about cutting off informed debate over U.S. foreign policy. "There is no reason why Israel, Palestine, the United States relationship with Israel should not be the subject of robust debate and discussion," said Steve Hunegs, director of the Jewish Community Relations Council of Minnesota and the Dakotas. "That's the hallmark of American democracy. But when we descend to ugly comments, or indulgent stereotypes, or casting aspersions, that degrades our democracy." Hunegs said he showed Omar and her staff a photograph of his cousin, who was killed in action fighting in World War II, to make the point that Jewish families are loyal to the United States and have made considerable sacrifices for that loyalty. Local Jewish leaders emphasize the ongoing conversation with Omar and her staff is ultimately about seeking better representation for this diverse district while avoiding divisiveness. "White nationalists seeking to divide natural allies of communities of color or Jewish people from Muslims, if we are challenging or fighting one another as opposed to challenging that ideology, they are able to continue to cause all of our communities harm," Rabbi Michael Latz of the Shirtikvah Congregation in Minneapolis told VOA. Abdullahi Farah, the executive director of the Abubakar Islamic Center, one of the largest mosques in the Minneapolis area, told VOA the community did not support hateful speech in any form and looked forward to an ongoing dialogue in the community. Omar's own history, first as a refugee fleeing violence in Somalia to a camp in Kenya and then emigrating to the United States, informs her perspective on democratic debate, Khalid Mohammed told VOA. Mohammed worked on Omar's campaign last year. FILE - U.S. Representative Ilhan Omar speaks at a news conference at the U.S. Capitol in Washington, Feb. 7, 2019. "She is a war survivor," Mohammed said. "So when you see her talking about injustices happening across the globe, it's not because she just saying it for the sake of saying it. She deeply cares about it because she'd been through a struggle." He does not see Omar's challenge to U.S. foreign policy as an attack against Jews, but a criticism of Prime Minister Benjamin Netanyahu's increasingly harsh policies in dealing with the Israeli-Palestinian conflict. "When she talked about Israel, I don't think she was going after Jewish people or their faith," Mohammed said. "She was going after one individual — the Prime Minister of Israel and the violations that he's been committing for a while and how the U.S. just turned its back on those policies." Omar could not be reached for comment. In a March 17 Washington Post commentary, Omar said her experience as a refugee informed her desire to find "a balanced, inclusive approach" to a two-state solution for Israelis and Palestinians. "When I criticize certain Israeli government actions in Gaza or settlements in the West Bank, it is because I believe these actions not only threaten the possibility of peace in the region — they also threaten the United States' own national security interests," Omar wrote. Omar's outspokenness has invited more than controversy. Mohammed pointed to an FBI investigation into a death threat against Omar written on the wall of a gas station in her district. Somali-Americans in Minneapolis also brought up a poster at a Republican-sponsored gathering in West Virginia linking Omar with the 9/11 terrorist attacks against the U.S. The state party denounced the sign even as Omar called it "the GOP's anti-Muslim display." Ultimately, Omar's re-election in 2020 could be at risk as voters in the Minnesota 5th weigh the consequences of a representative who courts controversy while provoking debate. The district is one of the most Democratic in the nation, meaning that a party primary challenge would be the best opportunity to unseat Omar. Rabb Latz said that while his synagogue does not get involved in endorsing candidates, challengers are already eyeing the seat a year and a half ahead of a potential primary. "I can probably count five to 10 off the top of my head right now of folks who are already considering running," Latz said.